"Er, back up, back up..."
1600 metres up on Drakensberg. Worth the climb. 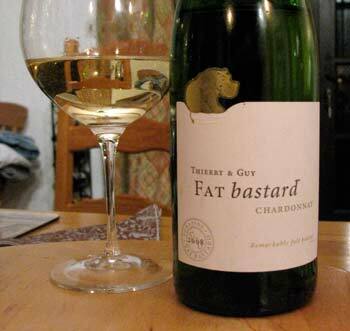 While in South Africa we couldn't resist this label. The wine was also very good! 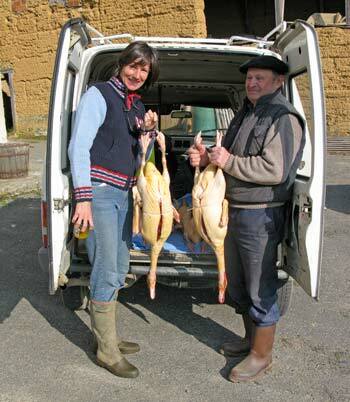 Ernest turned up with 5 ducks for Caroline to help prepare confit de canard. She spent the day with him and his sister Jeanette, cutting, cooking and putting into pots. The Trie gang hit Paris. 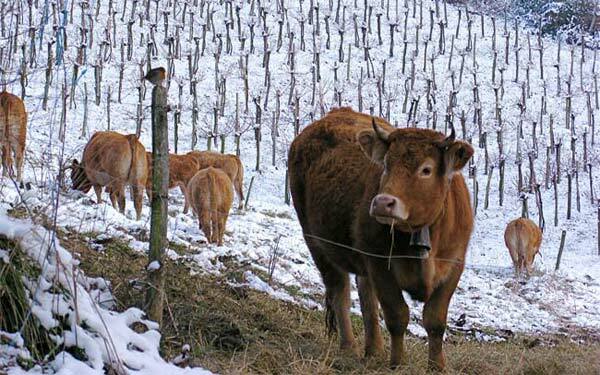 January was white and walking around Puydarrieux, the snow dampened all sound. Just the scrunch of it under our boots and then a welcoming fire when we got home. During the long evenings we watched our DVD collection and set out our plans for the house and garden for 2009 and it looks like being a busy year. As a break from the wet and cold, we went to South Africa. We were invited by Caroline's parents to share in their dual 70th birthday celebrations. Instead of a party, they decided on a family trip to one of the most breathtaking parts of the world. 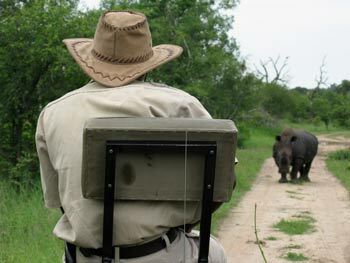 We landed at night in Johannesburg and drove all the next day to Kruger Park for a three days of game drives. We stayed at the Elephant Plains Lodgewhich we'd highly recommend. Check out the webcam of the watering hole in front of the lodge. You can also fly in from Jo'burg with a small propellor plane. We saw the big five. Well, at least some of us did. Only Perry and Lilian (our sister-in-law) made it for all three 5am drives and were rewarded with a real close up of a leopard. From there we drove for a day down to Swaziland, a land within a land. 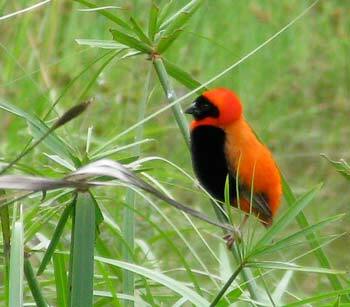 We stayed at a nature reserve surrounded by crocs, hippos and some fat red weaver birds. Once, Caroline had to turn back from a trek as she imagined a hippo bursting out through the head high grass and trampling one of us. Our birdwatching list went through the roof with an enormous selection of beautiful birds, all big tails and crests. Meals were served on a raised deck over a large pool which was ruled by a very big crocodile. The management had put lots of tree branches in the water under the deck to stop it coming too close, after a few tourists got drunk one evening and started teasing it over the railings. 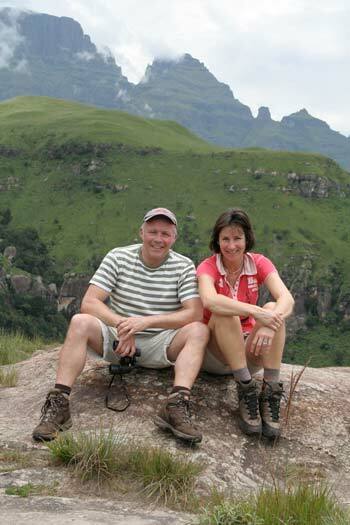 Further south back into South Africa towards Durban, is the Drakensberg range of mountains. We stayed three days there and did a lot of walking, fly fishing (well, Perry at least, for the first time since he was a young lad in Oxford) and eating. During one all day walk, we spotted a Secretary bird, pecking away close to us. They live off snakes and frogs, so we were very careful in the long grass since most snakes there are deadly. We flew from Durban to Cape Town and stayed at a fabulous lodge, overlooking the vineyards of Constantia the oldest in South Africa. We spent two days sightseeing and the third day was spent on more serious matters. A visit to the District 6 museum, a township and finally Robben Island, where Nelson Mandela spent 25 of his 27 years in captivity. We have placed a large selection of photos from our South African trip onto a web gallery. You can view them here. Back into the swing in Puydarrieux, Perry went off to Paris with the local rugby club to watch the France v Wales international. 12 hours in a coach, then straight to the ground. A surprise win for the French and a big night out in Paris. The next day they all went to the Salon d'Agriculture, a huge fair covering ten hectares of halls. They indulged in the products of many regions of France, especial attention being paid to the Martinique punch and Limousin beef. Sadly one of the group had a heart attack and died at the fair. In a state of shock, the rest drove back to Trie through the night and attended his funeral among hundreds more at our church in Puydarrieux. His name was Roland Deffis, a neighbour of ours in Puydarrieux. Aged 71, he had been running the kitchen of the rugby club on match and training days for 26 years. He'd warmly welcomed Perry as a dirigeant at the club and as a neighbour. Meanwhile, Caroline was up to her elbows in duck fat, making confit de canard. Ernest guided her in preparing gésiers, cuisses and magret that we now have stored away for when we don't fancy doing much cooking.